LONDONER Ronnie Blake reckons there was no home advantage after claiming the fourth leg of the Cuestars South of England Under-21 Gold Tour. FINAL LINE-UP, FROM LEFT: Ronnie Blake, club owner Tony Thompson, Connor Benzey. The 20-year-old from Carshalton defeated Connor Benzey 2-1 on one of the professional standard tables at Frames Sports Bar, Coulsdon. Benzey just needed the brown to win the first frame but lost on the black. The 14-year-old first-time finalist from Eastleigh forced a decider on the blue but Blake cruised to victory by a distance in the third. Blake, who climbed to third in the rankings, said: “It’s been a struggle but I came through. And he added that he rarely practises on the Star tables at his home club. Rankings leader Mark Lloyd (Gosport), beaten 2-1 from 1-0 up by his Premier Junior Tour colleague Blake in the semi-finals, extended his lead to 16 points over Anthony Rice (Fordingbridge). Ten-year-old Oliver Sykes (Chandler’s Ford) won all three group games against Blake, Rice and Arron Smith (Chichester) before going out 2-1 to Benzey in the last-eight. Mickey Joyce, appearing in his first Gold semi-final, lost 2-1 on the final black to Benzey. The 13-year-old from Basingstoke was promoted in 2014 after winning the Silver rankings title 16 days before his 11th birthday. 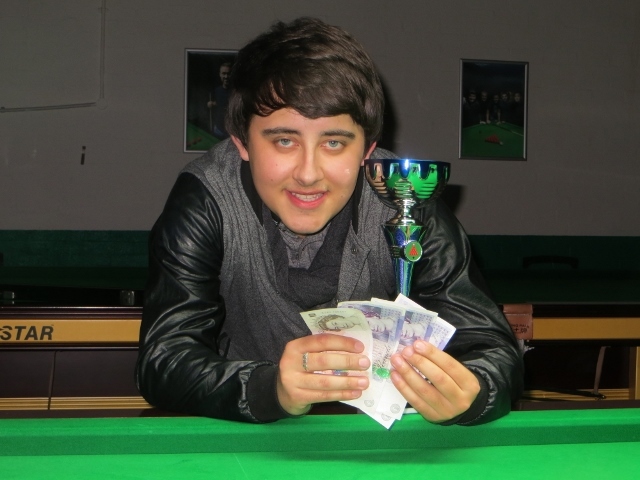 Blake knocked in the day’s highest break of 65 in his 2-0 quarter-final victory over Callum Browne (Trowbridge). For more information about event sponsor Frames Sports Bar, go to www.framessportsbar.co.uk and also visit www.cuesports.club, the new home of snooker. The fifth leg of ten is at Greenbaize Snooker Club, Bournemouth, on Sunday, January 8. Anthony Rice: 50, 45, 44. ROUND-ROBIN GROUP A: 1st, Mark Lloyd (Stoke SC, Gosport); 2nd, Mickey Joyce (Chandler’s Ford SC); 3rd, Dan Sykes (Chandler’s Ford SC); 4th, Bradley Cowdroy (Greenbaize, Bournemouth); 5th, Reece King (Greenbaize, Bournemouth). ROUND-ROBIN GROUP B: 1st, Callum Browne (Player’s, Westbury); 2nd, Connor Benzey (Chandler’s Ford SC); 3rd, Olly Gibbs (Chandler’s Ford SC); 4th, James Budd (Fareham SC); 5th, Steven Hughes (Chandler’s Ford SC). ROUND-ROBIN GROUP C); 1st, Oliver Sykes (Chandler’s Ford SC); 2nd, Anthony Rice (Salisbury SC); 3rd, Ronnie Blake (Frames, Coulsdon); 4th, Arron Smith (Selsey RBL, Chichester). QUARTER-FINALS (12 points): Lloyd 2 Gibbs 0. Blake 2 Browne 0, Benzey 2 O Sykes 1, Joyce 2 Rice 1. SEMI-FINALS (15 points): Blake 2 Lloyd 1, Benzey 2 Joyce 1. FINAL (£70/£35 25/18 points): Blake 2 Benzey 1.